The mural that Marines found Wednesday in Nasiriya depicts a plane crashing into a high-rise building. 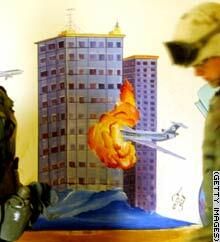 NASIRIYA, Iraq (CNN) -- U.S. Marines searching Iraqi military headquarters in this southern city that was the site of intensive fighting came across a mural depicting a plane crashing into a building complex resembling New York's twin towers, a news agency photograph showed Wednesday. The plane's logo and coloring resembled that of Iraqi Airlines, said Getty Images News Service executive Brian Felber, based in New York. The photograph, showing two rifle-toting Marines in front of the mural, was shot by staff photographer Joe Raedle, who is accompanying the 1st Marine Expeditionary Force from Task Force Tarawa. Getty is a news photo agency that distributes about 500 photographs from around the world each day and has 10 staff members embedded with U.S. forces in the Iraq conflict. Felber said this photo was "causing a bit of a stir."